When the plain sense of Scripture makes common sense, seek no other sense. Now, in the context of origins this principle (sometimes elevated to a “law” of interpretation) is often used by “ordinary folks” to support the Young Earth Creationist position, but it is not unfamiliar to academics either. I read recently one respected Evangelical scholar who returned from a “Framework” view of Genesis 1 to a “literal” 7-day creation (though not necessarily a young earth) because the plain sense of “a day” is a 24-hour period. …therefore, take every word at its primary, ordinary, usual, literal meaning unless the facts of the immediate context, studied in the light of related passages and axiomatic and fundamental truths, indicate clearly otherwise. Nevertheless, the basis for this rule about what is “primary”, “ordinary”, “usual” and “literal” is “common sense”. In fact, the rule has a clearly discernible pedigree from a particular historical setting: the “common sense realism” philosophy of the nineteenth century that began in Scotland but greatly influenced US Evangelical theology. I would suggest that it’s actually a rather poor way to approach Scripture, and is significantly at variance with the older hermeneutical revolution of the Reformation, which certainly stressed the centrality of the literal sense, but not by recourse to a rather intangible and protean concept like “common sense”. First, one must realise that the religious context of the Reformers was very different from modern Western concerns. In late mediaeval/early modern Catholicism “spiritual” meanings of the Bible ruled supreme, the “literal” meaning always being downplayed as misleading or even unspiritual, in favour of the allegorical. As far as the Reformers were concerned, this was largely to keep the power of interpretation in priestly hands and away from the people. But it was an entirely arbitrary method, by our standards. The man of God asked, “Where did it fall?” When he showed him the place, Elisha cut a stick and threw it there, and made the iron float. “Lift it out,” he said. Then the man reached out his hand and took it. Such a story would , in all likelihood, be taken as being symbolic of baptism, where by the power of God the believer sinks in the water but is raised to new life. The fact that a stick appears in the story adds value, because it can be seen to mean the cross of our Lord. The interpretation can then be padded out by saying our lives are only borrowed from God, and so on. Only the unspiritual man would think much about the meaning of these events in Elisha’s own space-time setting. 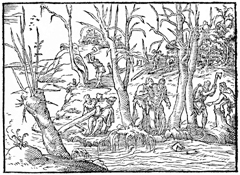 The arbitrariness of the method comes into relief when one considers that the story could equally be indicative of Noah’s Flood, the water representing judgement rather than baptism and the axe-head God’s preservation of the righteous. Or it could represent God’s secret counsel in creation emerging from the primaeval waters as reality… But in fact, once one is thoroughly immersed (sorry!) in viewing the Bible as a set of texts with trigger words for key Christian themes, “common sense” makes such interpretations far “plainer” than thinking hard about wider issues of context or culture. You shall understand, therefore, that the Scripture has but one sense, which is the literal sense. And that literal sense is the root and ground of all, the anchor that never fails, which if you cling to it, you can never err or go out of the way. And if you leave the literal sense, you cannot but go out of the way. He, and the other Reformers, sought that “literal meaning” not from common sense, but by full exploration of the passage in context and, over all, by the comparison of text with text to find the overall message of Scripture, into which a particular passage might fit. In modern terms this would mean actually forming ones worldview – one’s common sense – from the constant study of the whole Scripture. Tom Wright (for example), in The New Testament and the People of God, argues how the whole worldview of 1st century Jews was moulded by Torah, the Covenant and the history of their people interpreted by them. That made their understanding of Scripture’s “plain sense” utterly different from that of an American Fundamentalist in a dominant capitalist democracy. But the literal sense of Scripture remains the same, for in essence it is the meaning intended by the author (including the Divine Author). I discount the Postmodernists’ conceit that no objective meaning in a text is possible, but they are right to say that a culturally-conditioned thing like “common sense” cannot reveal it. The Apocalypse or Revelations of John, are allegories whose literal sense is hard to find in many places. Revelation, he says, has a literal meaning, but it’s often hard to find. The reason is, one can now say, not that the meaning is intrinsically dark and hidden, but that it mainly speaks in the language of Jewish apocalyptic, which would have been “plain sense” to initiated readers of the first century – and that would have included many, because apocalytic was a familiar genre in both Jewish and Christian circles, and its workings were as conventional as, say, science-fiction’s are to us. 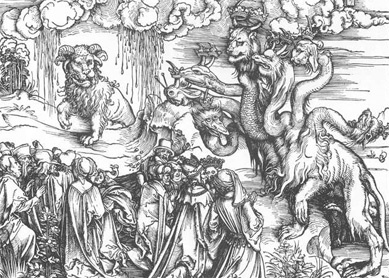 Tyndale would have been hesitant to interpret the beasts in Revelation in their “plain, commonsense” meaning – had he been coversant with 1 Enoch or 4 Ezra he would have confidently said the literal meaning was symbolic and representational, and even made a good fist of pinning down the symbols. Notice that including symbolism within the literal meaning makes it perfectly valid to seek such a meaning in a passage like the miracle of the axe-head, so long as it is the author’s meaning, not our own. Indeed, it is far more likely that a sophisticated author would include only events relevant to his overall message, rather than simply recording spectacular happenings, just as Jesus’s recorded miracles relate closely to his juxtaposed teaching. Such an interpretation would take into account such things as the enormous value of an iron artifact in the early Iron Age, and the overal purpose of Elisha’s ministry to God’s covenant people. I suggest that the “plain meaning” rule is dodgy as a principle. To assume that Genesis 1 is “literally historical” in its meaning, without exploring the worldview of the author and his culture, is as lazy and dangerous as to read Christian symbols into floating axeheads. But that’s not the only danger. Genesis is misread just as much when someone who sees evolution as “common sense” starts reading it into the command to the earth to “bring forth” flora or fauna, though that’s one stage better than the person who takes the meaning literally according to their “common sense” and then dismisses it as obsolete theology – that, of course, is a spiritual issue. Seeking the literal meaning also excludes (as Tom Wright points out) the private and arbitrary interpretations of believers. If it’s invalid to make the floating axehead point to baptism, it’s equally invalid to read it in your quiet time and take it as the Lord telling you, say, that an item you borrowed and lost is going to turn up soon through prayer. Tyndale says that the Catholic allegories would have been just as (in)valid if they came from Homer or the Sybilline oracles rather than the Bible, and the same is true of individual guidance. Wilkie Collins’ novel, The Moonstone has a wonderful character who is satirically represented as being guided in every situation by what he reads in that astonishing book, Robinson Crusoe. Just as Peter’s sword cuts off the ear, so does the law: the law damns, the law kills, and it mangles the conscience. There is no ear so righteous that it can abide hearing the law. There is no deed so good that the law does not damn it. But Christ, that is to say, the gospel, which is the promises and testament that God has made in Christ, heals the ear and conscience which the law has hurt. The gospel is life, mercy, and forgiveness freely given, and it is altogether a healing plaster. This allegory proves nothing, nor can it do anything. For it is not the Scripture, but an example or likeness borrowed from the Scripture to declare a text, or to declare a conclusion of the Scripture more expressly, and to root it and engrave it in the heart. For a similitude or example, imprints a thing much deeper in the wits of a man than plain speaking does; and it leaves behind him, as it were, a sting to prick him forward, and to awake him with. Moreover, if I could not prove with a clear text what the allegory expresses, then the allegory would be a thing to jest at, and of no greater value than a tale of Robin Hood… These allegories are not the sense of the Scripture, but free things beside the Scripture, and altogether in the liberty of the Spirit to use. I may not at all turn these allegories into wild adventures; but I must keep myself within the compass of the faith, and ever apply my allegory to Christ, and to the faith. 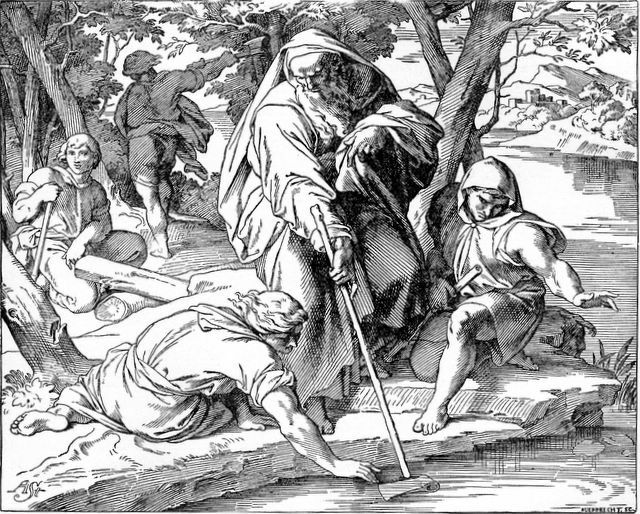 Interestingly, he points to Paul using just such a technique when he allegorises the story of Hagar and Sarah in Galatians – a truly “commonsense” understanding that bypasses some of the knots academics have got into when they tut-tut Paul’s “arbitrary interpretation” of Genesis there. To “borrow a similitude” is not the same as to demonstrate a meaning. 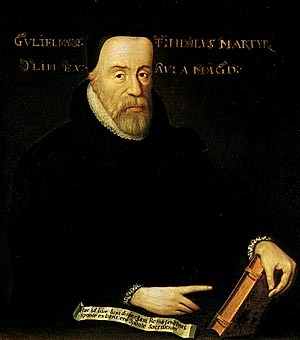 In summary, then, I agree with Tyndale that all Scripture has a literal meaning, which is the one we should seek, which accords with the intentions of both the human author and the Divine Author, the Holy Spirit, and which endorses the message of the whole canon of the Bible. I don’t believe, however, that it is to be sought in the “plain commonsense understanding” of the Fundamentalist, of the contemporary scientist or for that matter of the nineteenth century source critic, the secular critical historian or the Postmodernist who says the meaning is “my meaning” or “no meaning”. My own “plain commonsense understanding” is tarred by the same brush. But that literal meaning can be closely approached, aided by every tool of literary criticism, history and other knowledge, by the common sense of the person thoroughly steeped in the whole worldview of Scripture, who seeks understanding through faith in Christ by the Holy Spirit. But that’s scarcely “common”, is it? I would suggest there’s nothing more protean than Protestant hermeneutics. Then you’ve not read the Reformers enough. In devoting themselves to their task, Catholic exegetes have to pay due account to the historical character of biblical revelation. For the two testaments express in human words bearing the stamp of their time the historical revelation communicated by God in various ways concerning himself and his plan of salvation. Consequently, exegetes have to make use of the historical-critical method. In fact, Catholic scholars have used just the same panoply of tools, good and bad, as modern Protestant and secular academics – my recent focus on this subject was prompted by reading an Irish Catholic scholar’s book on the New Testament, which applied secular assumptions to arrive at a wide range of liberal and heterodox conclusions (eg “the resurrection does not mean an empty tomb”). Conversely, you won’t find many Catholic teachers nowadays promoting allegorical, tropological, and anagogical interpretations to the Bible. I imagine you can find a “Catholic” source for just about any set of beliefs. You could even get a “Catholic” to justify abortion (e.g. Nancy Pelosi). I think any valid interpretation of Scripture must come from, or be approved by, the Church – the same Church which was established by Christ and which formed Scripture and which existed long before the Scripture (i.e. Old AND New Testament) ever existed. Unfortunately for Protestants, they have no such Church. No. Unlike with the “true Scotsman” nonsense, one can readily and OBJECTIVELY distinguish “Catholic” hermeneutics from Catholic hermeneutics. A good tool for this is the Catechism of the Catholic Church. Do you support all the statements regarding Biblical interpretation that are made in the Catechism of the Catholic Church? For example, do you agree with the statement there that elements in the Garden of Eden story are “figurative”? And which elements do you think the CCC has in mind when it speaks of them as “figurative”? The question about the origins of the world and of man has been the object of many scientific studies which have splendidly enriched our knowledge of the age and dimensions of the cosmos, the development of life-forms and the appearance of man. 109 In Sacred Scripture, God speaks to man in a human way. To interpret Scripture correctly, the reader must be attentive to what the human authors truly wanted to affirm, and to what God wanted to reveal to us by their words. The three points from the Second Vatican Council that follow also echo Tyndale (not that I’m saying they drew on him, but follow the same reasoning) in subordinating meaning to the centrality of Christ, the totality of Scripture and the tradition, though placing as one would expect a greater emphasis on ongoing tradition. That last is interesting, though, for how does one “objectively” exclude the erroneous historico-critical stuff taught in so many Catholic (“Catholic”?) seminaries from “the living tradition”? Since Pope Benedict said that the historico-critical method was “essential”, though ofgten abused (as Anglicans like Tom Wright have likewise said), what “objective” criteria draw the lines within it as to what is “Catholic” and what Catholic, as opposed to just “sound exegesis”? Can you give an example or two? What exactly does that mean since one has gone beyond the literal sense, ie “…the sacred authors’ intention, the reader must take into account the conditions of their time and culture, the literary genres in use at that time, and the modes of feeling, speaking and narrating then current.”?? How can a sense that isn’t what the sacred author intended be “based” on it? Once more, a specific example would help – shouldn’t be hard, as the standard, you say, is objectively and readily distinguished. “That last is interesting, though, for how does one “objectively” exclude the erroneous historico-critical stuff taught in so many Catholic (“Catholic”?) seminaries from “the living tradition”? Offhand, I’d say by comparing that stuff to the Catechism. I’m not aware of any confusion, so perhaps you can provide a specific example of an interpretation that’s confusing you. Nah – if you reply to a post, it’s you who have to justify your arguments (eg why Paul means “The Roman Catholic Church” in Eph 3.10 when it didn’t exist). “OP” is “original post”, as in standard internet usage. Very good discussion, Jon, with many points worth chewing on. It’s the churches to blame, of course, using shorthand terms like “common sense” and then sanctifying them as eternal truths. Thanks for the explanation of OP. … you don’t know where that Church is today nor what its pillar and bulwark of the truth teaching is. Well, if we were taking Scripture plainly as well as literally, it would be Jerusalem where the church’s central authority is. That’s been Orthodox since 30AD. But capitalising CHURCH wherever it occurs in Scripture isn’t a valid exegetical method by anyone’s standards, and does nothing at all to show that the Roman Catholic Church is the sole referent of those texts, or since it didn’t exist when any of those passages were written, that it is even a referent at all – how could it be? It’s purely an ad hoc assumption, and would apply equally to the more ancient Orthodox Communion even if it didn’t actually refer to a spiritual body, rather than a heirarchical organisation. Though in fact the Orthodox heirarchy is just as insistent that theirs is the original and true Church. Both should know better after 1000 years of being mutual schismatics, but in truth the Orthodox have a better historical claim. I see a lot in Scripture about the Church of Christ, founded on the Rock that is Christ (Cephas being merely a little stone because, at last, he has recognised the Lord’s Messiahship in the context of the passage), consisting of those who inherit the promise of Abraham through faith in Christ’s sole Lordship. I see nothing nothing about Rome. Nor the Pope. Nor the catechism. Does it all come from one of those “anagogic interpretations” they talk about? Seriously, if you were more candid you’d see why other Christians down the centuries have baulked at the arrogance of Rome in claiming (circularly, and often as aggressively as you) to be the only true Church because Scripture says so, and when it’s pointed out it doesn’t say so, replying that it means that because the infallible interpretation of the only True Church’s tradition says so. I’ve been to the Vatican. And I’ve been to Jerusalem. Neither is heaven. Or do you think Acts 16:4-5 should read “they delivered to them FOR OBSERVANCE THE DECISIONS which had been reached by the buildings/soil of Jerusalem, even though the apostles and elders had moved elsewhere”? Assuming, contra Scripture, that “church” refers only to a spiritual body and not also to a hierarchical organization, where is the spiritual body today which is the “pillar and bulwark of the truth”? Which spiritual body on earth now has “the keys” (cf. Isaiah 22:22; Matthew 16:19)? As I recall, the ‘Peter’s just a pebble, not the rock’ argument withers when considering the Aramaic spoken by Jesus and the differing treatments of gender nouns between the Aramaic and the later used Greek language. But to which “stone” did Christ give the keys to the kingdom and the power to loose and bind in heaven? But that little pebble aside, Scripture says a) there is Christ, and b) there is the church founded BY or with Christ (not so much “on” Christ). There is probably no end to what you don’t see written in Scripture (cf. John 21:25). For example, truths such as the Trinity, the Eucharist, and at the other end, heresies such as Arianism, Protestantism. And no Scripture reference to more current matters of faith and morals like artificial contraception or partial-birth abortion or Ponzi schemes. Scripture is technically silent on limitless things. But that doesn’t mean limitless things are OK. Seriously, do you think the following is a “circular” argument, or is it rather a “spiral” argument? I hope to see your critique. The major flaw in the argument is the one you made: the assumption that the Church founded by Jesus Christ is coterminous with the Roman Catholic Church of today. Try telling that to the four other Patriarchates of the 6th century – well, Rome had begun to do that under Leo 1 – the first to make such a claim, some 400 years after Christ, and even that was a claim of seniority over the other Patriarchates, not sole authority. It was by no means accepted as the agreed foundational doctrine of the Church by the other sees, but seen as an innovation. Which it was. Antioch and Alexandria, were the other Metropolitan centres of the Church of the first centuries of Imperial Christianity, to which were later added Jerusalem and Constantinople. All but the last are as old as, or older, than the Roman Church. After all, St Peter had also been a leader in Antioch and Jerusalem before he went to Rome. None accepted that Rome was uniquely appointed to rule and “mother” the Church – all renounced Rome’s authority and began the process of schism from the West in 1054 by a series of mutual excommunications. Both East and West claim to be the sole depositories of the faith. Inasmuch as they do that (and thank God there are true believers aplenty in both) both are reflecting the power politics of the old Roman Empire, which institutionalised the Church as an earthly power, more than they reflect the spiritual Kingdom of Christ. And that’s the last word I have to say on the subject of Rome here. I’m not interested in arguing about what church is the true church, but I would like to hear your answer to our questions above (see the narrow columns) about the passages from the CCC, a document which you have just told us is a reliable source for Catholic doctrine. Do you agree with those statements in the CCC — or does even the CCC contain teachings that are “not truly Catholic”? True, it doesn’t specify, but I think many of the theologians who wrote the CCC (in its current version) are still alive. You, being Catholic, would probably be better placed to find out who they were, and get their addresses, and write to them, and ask them what they had in mind. If I had to guess, I would say that it is likely that what they had in mind is what many Catholic scholars have in mind in the books they have published. I would suggest to you that probably the majority of Catholic scholars today would say that much of the Garden setting, including the two trees, is largely imagery rather than report, and that the cherubim, and the serpent, too, would fall into that category. Of course, none of it has to be report for there to have been a real “primeval event” in which man broke with God. There is a Buddhist legend where a “Fall” of man into suffering follows from eating a fruit that is a delight to the eyes, and nobody supposes that Buddhism insists on the accuracy of such tales as history. I suspect the writers of the CCC thought the same: that there really was a rupture between man and God, but that the story told to capture the dynamics and effects of the rupture does not need to be taken as an item on the ancient six o’clock news. But if you can find out what the CCC writers believe, I will learn from the horse’s mouth. I look forward to your research. Also, you appear to be trying to make an equivalence between a Buddhist legend/tale and what the Catechism calls a “certainty of faith” from Revelation. That wouldn’t be right. As to my finding out who the Catechism writers were, getting their addresses, writing to them, and getting from the horse’s mouth what they had in mind, you’re free to look forward to these things. But I’m almost certain you’ll beat me to it. Of course I was not arguing that the Buddhist legend was an exact parallel of everything in Genesis 2-3. The point is that educated, thoughtful Buddhists told stories like that all the time, and we have no record of any “Buddhist fundamentalists” who insisted that “this event actually happened as described in the text.” The point in Buddhism is always to understand the meaning of a story, not to check it out for scientific or historical or geographical accuracy. I very much doubt that most of the writers of the CCC thought there was ever a garden with an actual tree whose fruit gave you eternal life, and an actual tree whose fruit gave you knowledge of good and evil. At least, I haven’t yet met a Catholic thinker who reads Genesis in that way. But since you are on the inside and claim knowledge of what real, authentic Catholicism teaches, and since you say it is taught by the CCC, you would have no objection to writing to the CCC authors ans asking them exactly what they meant. I wouldn’t know where to start. –	poorly, and perhaps misleadingly, worded. Well, we weren’t discussing social security, though the words seem entirely consistent with Christian teaching on social justice and the role of government. It is just to obey duly constituted laws, especially when they are to relieve human suffering. But I guess we don’t have the right-wing American hatred of “socialism” to the same extent over here. And the major flaw I see is your stance that the church of, for example, 1 Timothy 3:15, does not exist today. My senses of logic, faith, and Scriptural understanding all tell me it DOES exist. And further, that among the Catholic Church, the Orthodox, the over 30,000 Protestant denominations/independent congregations, one and only one could be the true Church of Christ. But Jon has spoken his last on this here, and Edward’s not interested.